The Long Gray Line Fund provides essential resources to strengthen the bonds that connect graduates to their alma mater and families to the Academy of their loved ones—or lost ones. The Long Gray Line Fund provides the means for honoring the courageous men and women of the Long Gray Line by making sure they never lose sight of one another or the Academy they love. Your support of the Long Gray Line Fund helps keep Herbert Hall, your home at West Point, open and functioning. 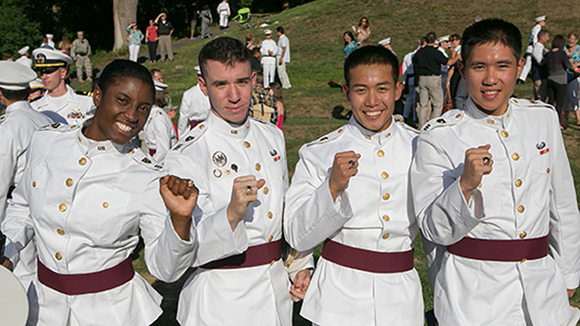 Your gifts also support programs such as the Ring Melt and 50-Year Affiliation Program, as well as communications from West Point, memorial services, class and society support, career services, and graduate archives—keeping you connected to West Point and the Corps of Cadets. You perpetuate the events, the awards, the traditions. You provide the means that honor you, your families, today’s cadets, and West Point itself—all hearts clad in gray. Connects you to fellow graduates by facilitating reunions. Links cadets and graduates through the 50-Year Affiliation Program. Recognizes great Americans through the Thayer Award, Distinguished Graduate Award, Valor at Arms, and other honors. Encourages graduate networks by hosting career transition job fairs. Symbolically connects every member of the Long Gray Line by organizing the Ring Melt ceremony. Brings families into the West Point fold by hosting receptions at significant events and through bar pinning ceremonies at graduation. Holds fast to the West Point family by offering memorial support. Connects to the past by managing the historical records archives. The tradition of excellence gets passed on through the annual Ring Melt Program, made possible through gifts to the Long Gray Line.